LibreOffice 5.x.x from WinPenPack.com has always worked perfectly on My Win-XP. I know. It turns out it was due to additional shared DLL requirements in 5.4.4 over 5.4.3. I'm working on a fix for the LibreOffice Portable 5.4.4 Still package currently. I have to correct JohnTHaller`s statement. All LibreOffice v5.x.x series are WinXP compatible. 5.4.4 and later do not work on XP. 6.0.0 and later will not work on XP or Vista. They have moved to a more modern compiler. I tried installing LibreOffice 6.0.0.4 to my spare Windows XP SP3 system and it declared that it needed Windows 7 or greater to install. The required Visual C++ runtimes are included within LibreOffice Portable 5.4.3 from PortableApps.com so it will work out of the box on Windows XP. Latest version 5.4.3 works perfectly on My WIn7 system. I have not updated any plugins, (Microsoft Visual C++) etc so it seems there was something else that caused no text in the interface (GUI). Note: Winpenpack says You need Microsoft Visual C++ 2008 Redistributable Package on Windows XP. LibreOffice series 5.4 are supposed to be the last version supported by WinXP. LibreOffice Portable v5.4.0 does work correctly on My win7 system. It does on My winXP, however. Ive tryed the edition2 version from Portableapps, but its the same issue. The issue is, theres no text in the interface (GUI). This is a problem reported on earlier versions of LibreOffice. Scroll down to Platform Compatibility - Windows and you'll see that it mentions the MS VC++ 2015 runtime is required and it needs to match the bitness of the version of LO used. If you're on a 64bit system might as well install both 32bit & 64bit. LibreOffice Portable v5.4.0 is the last version supporting Windows XP. The portable version made by PortableApps.com is no longer compressed with UPX and is therefore as fast as X-LibreOffice when loading. LibreOffice Portable is compressed using UPX to make it a lot smaller (268MB vs X-LO's 523MB for an English install) which also speeds up startup times from the vast majority of external drives. The tradeoff is that it will take a few extra seconds to start off an internal drive vs an uncompressed copy... 3 vs 5 seconds for a cold start on my machine. As many knows, LibreOffice Portable from PortableApps.com takes a long time to startup. On my system it takes 13 seconds from a fresh boot. wants the portable version to start faster, use X-LibreOffice from WinPenPack.com. Calc, Writer and the other stuff also loads faster with X-LibreOffice. This discussion should move to the official forum topic, IMHO. John T : Thank you for replying. I use Avast free AV. Here's the thing though: I even compress the Bernat version MORE with the PortableApps.com AppCompactor to reduce the size as much as I can and Avast has no problems with that. I have tested both versions on 3 computers, one doesn't even have AV installed on it yet, superfresh install. The computers have SSD, SSD/HDD hybrid and a regular HDD. Windows 7 runs on those machines, one is 32-bit. Same results on all of them: Swedish and Finnish LibreOffice from portableapps just struggle to open. Earlier in this thread joby_toss said it takes a minute to open on his laptop, which is abysmal. Clearly Bernat does something differently with the non-English stuff then, since his version is a snappy Swedish LibreOffice and yours is not. No disrespect, your stuff is much appreciated and most of the times phenomenal. Just this LibreOffice thing has been bugging me forever now, so I will continue to use the one that works like I expect it to. webfork & SYSTEM : I am not interested in the installer version one bit, this website is called portablefreeware =) I go with portable versions in all my programs wherever possible, it's the best invention since sliced bread. Scrap that, it's better than sliced bread. Also X-LibreOffice is no option since I already found another one that is working. MaxH: X-LibreOffice would be another option. AFAIK, winPenPack doesn't compress binaries like PortableApps.com does. Max H: Several things here: you're right that the program should work dramatically faster on an SSD drive, but I am also curious if an AV scanner is the reason things are slowing down. The difference between the two projects' programs should be minor. Also, if you're really desperate for every extra little bit of speed, the installer version has a quickstarter option which should be faster than both projects. Max H - A few lesser antivirus scanners have issues with compressed files, so they wind up taking a lot longer to scan a compressed file. If you happen to be using one of them, you can uncompress LibreOffice Portable using the PortableApps.com AppCompactor with the DECOMPRESS option. LibreOffice Portable is tuned to be a balance between size and speed, compressing only DLLs and EXEs that are over 1MB, which saves up to 200MB on install size depending on which language and options you use. Even that isn't quite enough for some of the lesser antivirus scanners. We revisit the tuning rather often, so knowing which antivirus you're using could assist us in the future. To webfork: I just downloaded version 4.4 and still no luck opening Excel files, either xlsx or xls. Version 4.2.8 does open them OK. Very strange that Word files open OK, but not Excel files. John T. Haller is going to hate this: Because LibreOffice has been embarrassingly slow to start when using non-English, I decided to give the version from portableappz a spin. Yes, the great nemesis of John, sorry.. That version starts up instantly, so something in this one is really messed up. On a brand new computer with a top of the line SSD, anything that takes more than a fraction of a micromillinanosecond to open is outrageous, let alone something that dares to have me wait for 8 seconds. Bernat 1 - John 0, game on ! PS: I have tried with Swedish and Finnish, both slow starters. English is ok. Maybe this version hates the Nordic countries haha..
br3: You might try opening it in one of the other freeware spreadsheet tools such as SoftMaker Office or Gnumeric to see if they have a similar issue. If they also have a problem opening it, the issue might be with the file itself. If they don't, you can probably save it to a friendlier format for LibreOffice (like XLS rather than XLSX) and try opening that file in LibreOffice. Thanks for your reply, sorry I haven't been back in a while. I just tried again, using version 4.3.5.2 and got the same error message (General Error, General input/output error). Though, no issues with opening Word-saved files. There aren't any non-English files in the file name. It's been a while, but I think I had tried the prior version and that opened my Excel files OK.
Any other ideas/suggestions most welcome. br3: I haven't run into that error and I've opened a lot of Excel files in Libreoffice. A quick search suggests it might have to do with non-English characters in the file name. Is anyone running this on XP? I just 'installed' the latest version (on XP Pro SP3) and it will not open Excel files (xlsx, xlsm), but it will open Word files; all saved in Office 2007. The error box says General Error, General input/output error. Very happy with the last few updates ... program keeps getting better. Quick note about an update on a very common operation: LibreOffice now pastes info from Microsoft Word as a picture by default. You have to do an "Edit - Paste Special" (or CTRL+SHIFT+V) operation to get the text and/or formatting. This extra step functions better than the previous method which was just a vague guess about formatting you wanted to keep. Against my better judgement, I downloaded this again. They have shaved off a few seconds from the startup time, but still embarrasingly slooooow compared to OpenOffice. At least it's going in the right direction.. The previous versions took 10 looong seconds to start LibreOffice, if the language was anything else than English. This wouldn't be so shocking with any old pc, but mine has a SSD drive and all the bells and whistles, a ROCKET I say. So 10 seconds, on SSD, in 2014? Really? I tried OpenOffice instead, and BLAM, it opens instantly! Could anyone confirm this issue has now been fixed, because I honestly can't be bothered to download LibreOffice and be disappointed again for the umpteenth time..
FYI, as of 4.2.0 upstream LibreOffice no longer allows you to install only Writer. As John wrote above, the option was quite pointless. Can`t say too many bad things about LibreOffice. I don`t use it often, but its very useful for when I do. Considering software of this calibre is free, it retains my respect. I unpacked Libre Office to a third level sub-directory and found that due to the large number of additional sub-directories in Libre Office, the names became too long and unusable. The solution is to unpack it as close to the root directory as possible and remember to put Portable Java at the same directory level. "Includes excellent compatibility for 100s of file formats including OpenXML" - that must be a joke??? LibreOffice still messes up 90% of my Word-, Excel-, and PowerPoint files. Especially docx, xlsx, and pptx formats. If you value maximum compatibility, LibreOffice is pretty poor. SoftMaker FreeOffice in this relation remains unbeaten. @lux: I think the objective is making LibreOffice less huge by sharing code between components as much as possible. @webfork: Thanks for your suggestion about the possibility to install only Writer (installer)! I'll do. @JohnTHaller: Thanks for the clarification. However I find quite unpractical nowadays the idea of a huge monolithic software, eating resources, without giving the user the possibility to choose what to install. Installing only Writer is a bit pointless. Unlike Microsoft Office which is mostly separate apps, LibreOffice and OpenOffice are basically a single app with different functions. If you check your install size, you'll note that it barely makes a difference. Last I checked, only installing Writer and Calc (the most common request, leaving out Draw, Base, Impress, Math) only saved a grand total of 9MB. lux: I'd forgotten but the installed version has the ability to only install Writer. I don't think PA would have much interest in creating multiple separate Office packages, but you might have some luck talking to the WinPenPack project, who might be interested in a way to differentiate themselves from PA.
Midas: I've been there with both LibreOffice and Word. I frequently have to pull text out of a file, switch it to text, and then push it back into a fresh LibreOffice/Word file to get around weird formatting nightmares that crop up. @webfork: Thanks for your prompt replay! I agree with you about the bullet/outlining system, however I'm using Writer to write articles and research papers where bullet/outlining isn't really important (at least for my needs). Still is very annoying to have to install the full package of programs just to use Writer. And I have the impression that the developing of Writer is somehow going slower comparing to the other programs of the package. I reckon that Writer may be superior to Word in some features but, sad to say, it doesn't offer the keyboard customization of Word (Tools>Customize>Commands>Keyboard). Furthermore, I think that the updating features of LO should be implemented, otherwise shall happen like in Germany, where some public administrations are unfortunately going back to M$ Office. lux: I switched to Writer because the bullet/outlining system is radically better. Word's indentation system is written by idiots and after a few weeks of working on one Word document, the bullets will inevitably start out in the center of the page and then jump way off to the right. As to why they don't break it up into parts, I think it's probably because the code base is now 12 years old and breaking that up would take a lot of time and money. I had a great hope for this program, and despite my will, I have to go back to M$ Word. 1) Why should I install all the (huge) program package if I use only Writer? Is really impossible to allow the user to choose which programs should be installed? 2) Sad to admit, but still Writer cannot compete with M$ Word regarding features: i.e. is quite complicated to format in small capital letters or to customize the keyboard comparing with M$ Word. Just discovered this program has a basic tool for importing Visio tools, which is going to save me huge amounts of time. 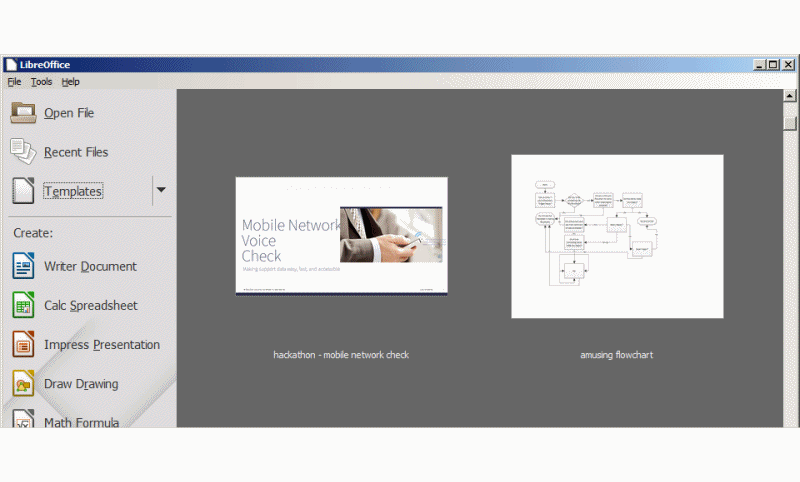 With lots of experience using the Microsoft Visio Viewer over the last few months (tedious, annoying, and has only the barest feature set) I'm very happy. Although import tests I've done so far don't look just like the original, the program at least allows you to copy text or modify it into something that isn't Visio. Opens very slowly, but I just open it when I log on and it's ready when I need it. I'm using it as a word processor for appellate court briefs and for that it does everything Word does. Note that pleading templates are not used in the courts where I practice. Indra: good to know, thanks. I just get the PDF thing work now. Just download the extension from OpenOffice website (OraclePDFImport 1.0.4) and drag it to LibreOffice portable; The OraclePDFImport 1.0.5 in LibreOffice 3.4.2 doesn't work at all. Once I replace the 1.0.5 with the 1.0.4, the LibreOffice portable can create password protected PDF and import PDF as well. I appreciate John''s effort to make LibreOffice portable, so save a bunch of my time for I don't have to struggle with the instructions to make LibreOffice portable. Odd experience here. I downloaded the LIB/O installer to my thumbdrive and it took quite some time to install. The installation went fine but I found that the install had changed the program icons for all of my Open Office docs on my main hard drive. That caused all of my O/O files to "forget" the application that created them forcing an "open with..." need because it could not locate LIB/O from the Thumb Drive when unplugged. I had to go through massive Regedits to clean up all references to LIB/O and had to reinstall O/O on my main drive using the "repair" function within the O/O/ installer. That should not have happened. Ruler setting to inches does not stick - even after unchecking the "Enable char unit" setting. The tab setting of .5" does stick (unless that is the default). The ruler problem has been solved (thanks, John), but the documents folder issue remains (personal setting doesn't stick). I haven't checked other settings yet. MarkB: I had some problems with language settings that have been solved in this release (http://portableapps.com/node/26939). I can't confirm ruler problems, but save folder does seem to default to the folder just under LibreOffice. For one reason or another it does not keep some of my settings, e.g. rule units and documents folder. That makes it rather useless. @Mike.S.G. : OpenOffice.org Portable 3.2.0 is 160MB installed. If you install one of the standard set of languages of LibreOffice Portable 3.3.2 and have it remove extra languages, it clocks in at about 260MB (100MB larger). We'll even be getting that a bit smaller with the next release. I'm not saying LO is bad, just not worth the extra overhead at this point. I downloaded and tried LibreOffice earlier today. For some reason my cursor will not display in the document screen in Writer. I checked Calc and had the same problem. Mouse cursor does show up and I can type but no cursor. No problem with this in SoftMakers Text and Plan applications or in Microsoft stuff. Something I'm missing maybe? LibreOffice Portable (unike OO) has no local help files, a backward step IMO. It's good to see some competition for OO though, interesting times. @PartiallyTarded - Our focus is on LibreOffice as well, which is why we worked with the LO team on LO Portable and already have a patch in the works to improve portability, response time and language switching. @John, shouldn't your focus be on LibreOffice instead? since most of the devs have moved on. @Dan - We're in discussions with Oracle to get licensing permission to repackage OpenOffice.org as a portable app. Currently, you can't repackage 3.2.1 or 3.3 without their permission, so any portable packages of it you see are being doing illegally. That's why OpenOffice.org Portable is still at 3.2.0, because we do legal software. As I understand it, PApps is (was?) trying to work out a deal that would make them the official distributor for OpenOffice portable. I assume it didn't work out? I wonder, is there a way to start LibreOffice Writer in Web layout by default? The splash screen is built into LibreOffice itself and we worked on the branding for the portable version with the LibreOffice team. (This is the official portable version and is being made available from their own servers.) If you want to load in the standard LibreOffice splash, within LibreOfficePortable\App\libreoffice\program just delete intro.png and rename intro_original.png to intro.png. And GMS9810, there is no legal portable version of OpenOffice.org past 3.2.0. Any site packaging 3.2.1 or 3.3 is packaging and distributing it illegally. @Tala: Surely Terrine has thought of that. Anyway, the LibreOfficePortable.ini trick doesn't do it this time. Still, it would be nice to get rid of PortableApps splash screens once and for all. Who do they think they are, Microsoft? @Terrine: Make sure you have renamed the "AppNamePortable.ini" to "LibreOfficePortable.ini"
Saying there is no portable version of OpenOffice or LibreOfffice is silly since both can be downloaded all over the place. @Emka: Yes, usually - but it's still there! @Terrine: You usually have to copy the APPNAME.ini file from X:\APPNAME\Other\Source to X:\APPNAME (folder where the launcher is) and in this ini file set disablesplashscreen=true. How to disable the annoying PortableApps splash screen? Oracle won't allow portable versions of OpenOffice 3.2.1 and forward, since those are the versions they technically own. So while LibreOffice 3.3 has a portable version, OpenOffice 3.3 doesn't (at least, not legally). First, OpenOffice is heavy on the memory footprint. Every since all the contributing programmers got their hands on it, they simply forgot to make it lighter on the memory. Because of that I uninstalled it long ago. As for OpenOffice being portable, "bastik" said (above) "They simply wont allow to create new portable versions"....and "Gmacri" says he/she installed OpenOffice portable. Whats the real deal, is it or isn't portable??? Yeah... But, like, that means you deleted a folder, at no cost to your data or system, right? MAN, I love portable software... Even when it doesn't work. I installed LibreOffice in my flash drive. When I started the program my system (Win7) freezes. It don't work at all. So I uninstalled. I have now Open Office portable, is the better option. Cridland: although I have some possible answers, this is a complex topic and therefore better served in the forums. I appreciate everyone's sincere answers to what was a kind of silly question, but there's a lot of nuance in all this. > he community of OpenOffice created a fork. So this is kind of like when Unisys tried to reign in GIFs... No matter what Oracle does, there's a kind of cat-out-of-the-bag thing happening here, isn't there? As cloudy apps seem to be such a big part of the future of personal computing, this release may be the last SUPERBIG EVERYTHING office suite that most of will ever need to own for our x86 desktops or laptops... Right? You should know that the latest version of OpenOffice Portable is 3.2.0, although there exist newer versions of 3.2.x. Also there's no portable version of OpenOffice 3.3. OpenOffice is now owned by Oracle. They simply don't allow to create a new portable version. Forget Micro$oft. If you want an M$ Office lookalike buy that product. This is a different program. OpenSource, you know. "Differences will start to be more visible starting from LibreOffice 3.4 which will be available in mid-2011." "[...] But it's when talks arise about changes under the covers in LibreOffice 3.3 that some of the Document Foundation's excitement about a fresh start becomes more apparent. [...]"
"Similar to OpenOffice.org, LibreOffice relies heavily on Java, and as such it remains vulnerable to potential legal attacks from Oracle..."
after Oracle bought out Sun, openoffice's future became slightly 'unstable'. In order to keep OO intact as it were, many of the developers branched off the source. So I downloaded it, but it looks essentially identical to OpenOffice... So close that I assume there's a lot of common code. What's the point? Not the point of having it here, but why did someone go to the trouble to crank out "just another" office suite to offer at no charge?